To create effective website content … know your audience. Content marketing is an effective way to stay in touch with your audience, provide them helpful information, and in so doing, position your firm as a company they would want to do business with. But it’s not just touting your features and benefits. It’s all about understanding your audience, knowing the problems and challenges they face, and giving them helpful information and insights they can use. But what do you do with all the fascinating blog posts, news items and infographics you add to your website over the years? Knowing what your readers want will help you organize your content to ensure that your website’s navigation remains simple for your audience as the number of your website content pages and posts expand. So how do you know what your readers want? Well, one effective way is to create a customer Persona. These fictional characters are compiled from data collected in surveys and interviews with real customers, feedback from your sales and customer service departments, and user analytics from your website, blogs and newsletters. 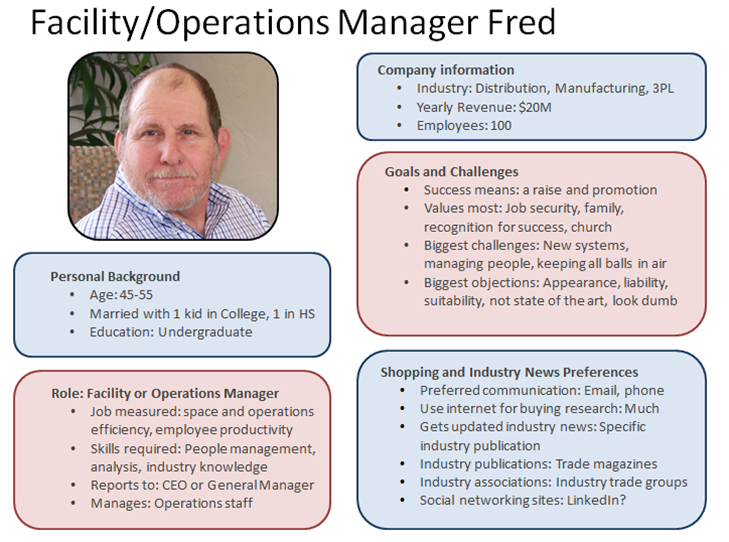 Sample 1: “Fred” was developed for a material handling equipment provider of pallet racks and industrial shelving. 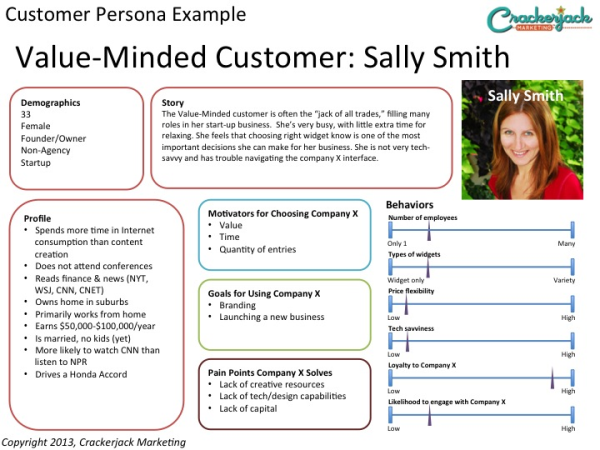 Sample 2: “Sally Smith” is more generic and can be used for a number of industries. The next step is to create, and then categorize, website content targeted specifically for each customer Persona. For example, “Sally” listed above is not very tech-savvy and will respond better to content that is more educational and uses simple layman’s terms to describe your product’s features and benefits (and why it’s ideal for Sally’s needs). In contrast, a more tech-savvy person understands the specs and industry jargon and thus will more likely respond to articles with a straightforward price and features comparison. Your blog and articles archive can thus be categorized by topic vs. year, which is much more helpful for your readers. For example, “Sally” could find the info she needs in a “How To” section, while the tech savvy reader would peruse the “Product Comparison” section. This way, each target audience member can quickly find the information best suited to their needs. 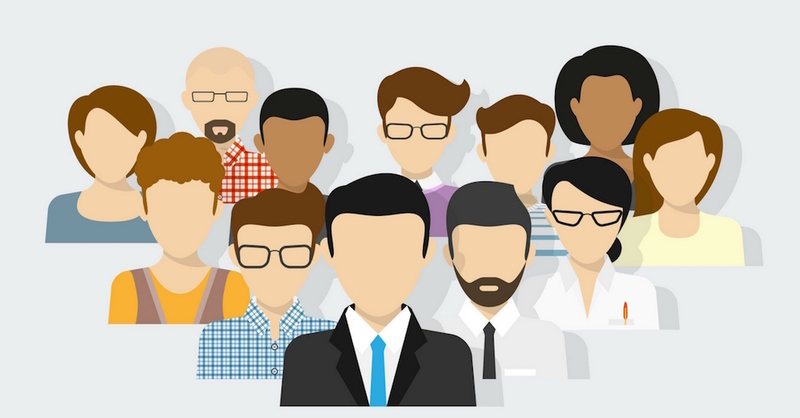 Although it will take some time and effort to create customer Personas, it will be worth it in the long run. You can add website content in a way that is organized, user-friendly, and specific to your different audiences—reinforcing your image as a company that knows their customers and gives them the helpful, insightful information they need. Posted in Blogging & Content Development and tagged content, effective website content, personas, westchester marketing cafe.